Teaching groups since 2013, Kimberly is very skilled at articulating to others the core concepts and methods of relationship based horsemanship. Kimberly is constantly striving for ways to help horses and humans understand each other so both can flow together in harmony. Through years of personal work in the mt. trail/extreme trail discipline, Kimberly has developed a keen and unique sense of navigation and problem solving with horses. She has taught and shared her ideas through private mentorships and clinics. Notable clinic hosts have been Shepard Rd. Mt. Trail (2014-2018), Southern Oregon Mt. Trail (2014), Lost Legends Trail Course (2015), and Mustangs to the Rescue (2014). Spring 2018, 2019, Kimberly joined the line-up of clinicians who teach at the Oregon Horse Center's Mt. Trail clinics and schooling shows. Learn one of the most valuable, practical, and rewarding forms of groundwork with your horse. Long line ground work gets you moving, navigating and solving problems together. Moving at eye level with your horse provides opportunities for you to develop and refine your understanding of movement, body mechanics, and communication. The concepts are team building with your horse where you will learn about moving in a synchronized and connected way building rapport and confidence. Our on-site trail training course is full of natural obstacles as well as a few man-made ones, giving opportunities for hands on application of skills. We will use a round pen with some simple obstacles to learn the basics, proper form and technique, as well as steps to develop your understanding of the line work. We will also show you how to acclimate your horse to the lines, the body language involved, and cover the most common issues that arise when a horse is learning lines. Throughout the 2018 season, we will be offering demonstrations as well as hands-on 1-2 day workshops on this rewarding practice of long line work. In order to keep the experiences small and intimate, we will be limiting demonstrations to 5 persons and hands-on workshops to 3 persons at a time. Check the schedule of dates for offerings from beginners to advanced. Requests for added dates are possible for groups of 3 or more. There will be opportunities to learn with our horses who are experienced with obstacles and the lines as well as teaching your own horse. Our horses are pony sized, calm, patient and gentle. From Kimberly Dunn, "Every horse that comes into our training program learns this beneficial skill before being saddled and mounted. It is the perfect bridge from in-hand leading to navigating under saddle. By the time we have our first ride, the horse already understands how his/her body relates and responds to the rein aids. The lines can also be used to teach basic moving off the leg. This practice gives the horse better ability to focus on balance and feel of their rider because they already understand rein work." Watch and ask questions while Kimberly goes through all the basic steps in getting a horse to navigate safely and properly with the lines. 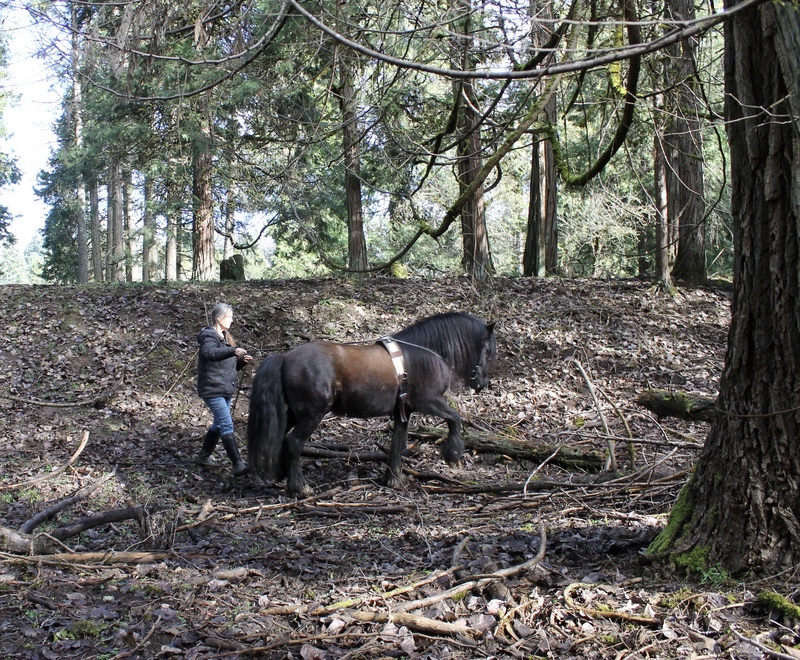 Kimberly will cover the pre-groundwork steps to helping horses understand the concepts and build their confidence leading out on trails. Opportunities will be provided for individuals to experience the lines and do some simple line driving. Watch and ask questions while Kimberly shows more technical navigation and maneuvers with the lines. Kimberly will utilize natural and man made obstacles on the Get Grounded Trail Training Course to show safe navigational techniques. Opportunities will be provided for individuals to handle the lines and driving on the course. Perfect for horses who need to learn about trail obstacles. This workshop will cover safe navigation with their handler at eye level. We will cover working with an emphasis on synchronization through body language and position to help the horse understand proper body response. This allows you to minimize use of aids (crops, sticks, lead rope overuse). This workshop will have you working hands-on with your horse or ours, showing proper steps and techniques to getting your horse to basic line driving in the round-pen as well as on our trail training course. We will cover safe forward navigation, reliable stopping, simple direction changes and basic backing. We will show you proper use of equipment and good rein management skills. Contact me if you want to request a date. On-site Overnight possibilities for you and your horse. Water and Beverages provided. Bring your own lunch. Sunscreen and bug spray recommended. Extra dates available by request! I'm looking forward to joining the line-up of clinicians at this very popular, well known clinic. The OHC Mt. 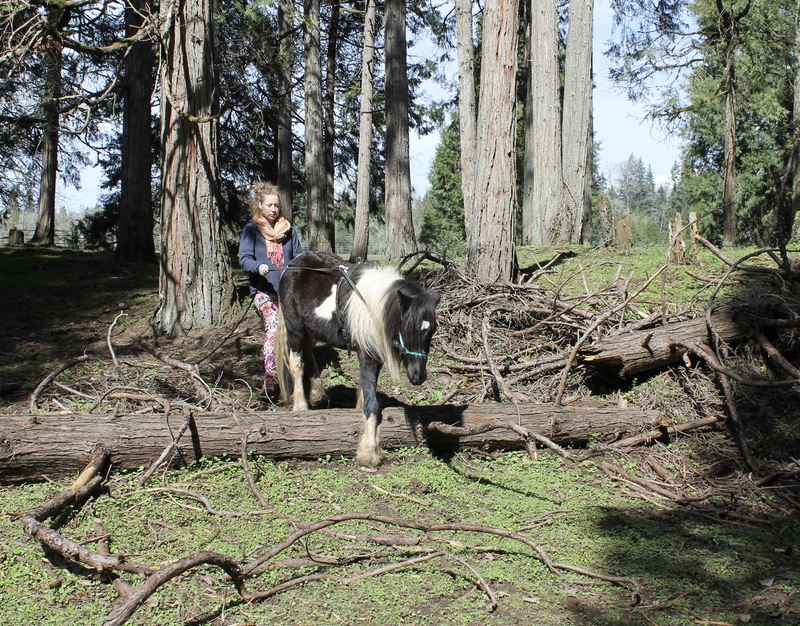 Trail clinics provide many opportunities to grow and learn with your horse. Mt. Trail is a great discipline that fosters the core qualities of good horsemanship. Learning opportunities abound in mechanical and navigational skills. 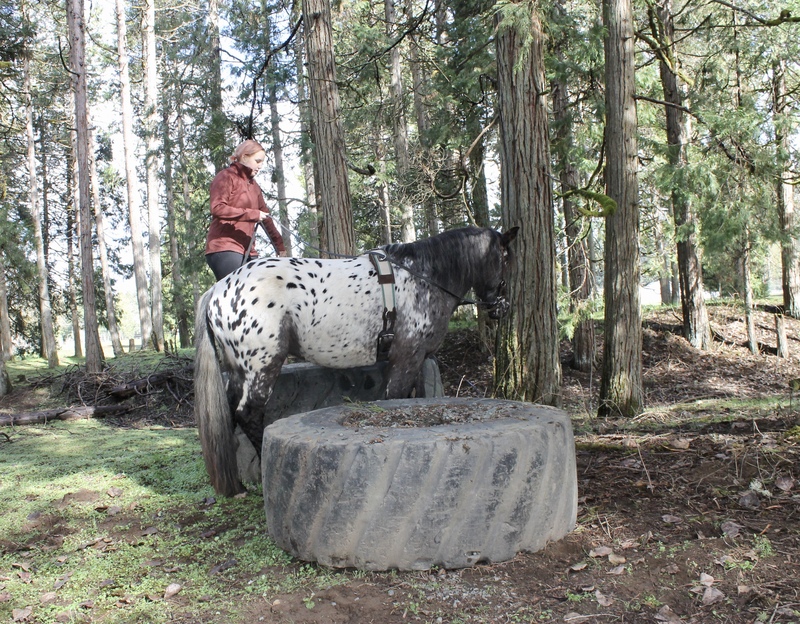 Obstacles can be a vehicle for building confidence and trust while fine tuning communication with your horse. Obstacle navigation can also act as a basic foundation for any horse working in any discipline. For more information and to sign up, click on this link for the OHC website. Kimberly will be one of the presenters in a obstacle horse/mt. trail demo taking place at this event. Kimberly will be showing obstacle work in-hand while others will be riding the obstacles. Mark Standley of Shepard Rd. Mt. Trail will be speaking about obstacles and mt. trail during the demo. Obstacle challenges, such as mt. trail, and other task based challenges are typically designed to test the physical and mental abilities of both horse and rider. Success in this type of work comes best when the horse and rider are working in sync as a team. The team needs a thoughtful leader with an equally thoughtful and willing partner. In this clinic, Kimberly will provide tips and suggestions for ways to improve your leadership role with your horse. She will give you insight into the mindfulness needed to be successful at accomplishing tasks with your horse. As you work through the obstacles, Kimberly will provide insight into body mechanics, bringing out willingness, and building confidence and trust. Kimberly strives to help others understand the importance of thinking, planning, and being accurate with timing of correction and praise. In Kimberly's opinion, "There are no 'good' or 'bad' horses, just horses that are developing understanding and willingness." Kimberly has found one of the best ways to help the horse develop understanding is to work at eye level with the horse. While riding throughout the clinic, Kimberly will demonstrate how to use ground-work protocol that will carry up into your saddle work. Kimberly hopes, through her insight, you will have better understanding and awareness of precise communication, focus, and body language. SOMTO Horse Park is the perfect place to spend the day having fun, growing and building your partnership with your horse. The obstacle course is surrounded by 120 acres of pastures, oak savannas, and conifer forests.